The voting ought to take place according to the international standards. 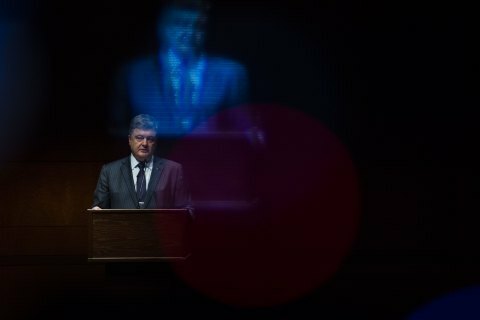 Ukraine remains committed to the implementation of the Minsk agreements in their entirety and finds them to be the only option for the peaceful settlement on the table, President Petro Poroshenko stated speaking at the Forum "Ukraine’s Battle for Freedom" in Capitol (Washington). According to him, Ukraine is interested in holding local elections in Donbas. Although, as the President noted, these elections are possible only by following three conditions. Russia has to implement security provisions of the Minsk arrangements and does not manipulate with the phrase "holding local elections in line with the Ukrainian legislation and international standards". "Free and fair elections means that elections should be free and elections should be fair. We cannot accept legitimizing the occupation of Donbas through farce elections or Russian understanding of free and fair elections, which has nothing to do with democratic standards. We have exact criteria of the OSCE that define free and fair elections. And these elections should be accepted by the whole world," Poroshenko said. The second condition according to the President is the OSCE police mission in Donbas. He says that the international community has to deploys an enhanced OSCE police mission in Donbas to ensure security before, during and after the elections. The third condition, as Poroshenko said, is the beginning of work towards eventual restoration of Ukraine’s control over the uncontrolled part of the Ukrainian-Russian border. As reported before, on the eve Poroshenko stated that he would cooperate with Rinat Akhmetov and Yuriy Boyko if those win at fair election in the occupied part of Donbas.